This is another movie, much like The Thief and the Cobbler, where I picked one version of a movie without knowing there were other (and better) versions available. 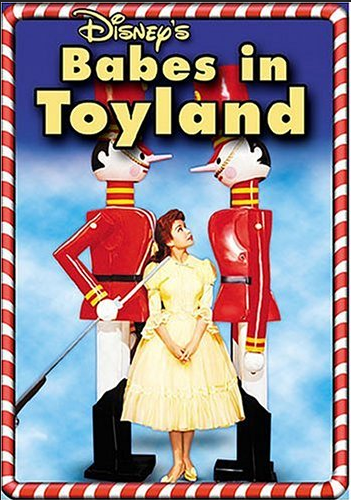 I thought this production of Babes in Toyland, filmed in 1961, would be a solid pick. It stars Ed Wynn as the toymaker, a.k.a. the guy who voiced the Mad Hatter. He’s a legend. Ray freaking Bolger is in this movie! As in Scarecrow! Yeah, it doesn’t make a difference. This movie is terrible. There isn’t even a Maleficent Effect, wherein the acting performances are luminous enough to bring up an otherwise flat movie (observe: Angelina Jolie in Maleficent). These stars have no room to breathe and make their parts their own. It’s as if this movie is determined to be bad. The gist: Reconting this plot literally makes me gag. Here we go: The land of Mother Goose contains all the characters from nursery rhymes that we know of. Most important among them are Mary Quite Contray and Tom, who somehow doesn’t have a last name. They’re going to be married. Fine. But the evil Barnaby wants to marry Mary himself, to ensure that he gets the inheritance that she has no idea she’s just inherited. Generic enough setup. But it’s when the plot starts moving into motion that you see just how weird this whole production is. Unlike later (and earlier!) versions of the story, Barnaby is a horrible villain. He comes up with an intricate plot to steal Mary’s sheep (Bo Peep is her little sister), robbing the family of their income. He then arranges for Tom to be killed, but that eventually blows up in their faces. They make it to Toyland near the end of the movie, where we meet inconsequential characters and find more devices that Barnaby can use to devise even worse evil plans. It’s not a fun time. What I “learned”: After seeing this movie, I believed I’ve figured out why some of the worst movies on earth develop cult followings. It comes from a quote from the fictional Rosalind Lutece, who was quoted as saying, “The mind of the subject will desperately struggle to create memories where none exist.” I believe that in an absence of depth, the mind of a viewer will struggle to find meaning or likeability in a movie even if none should exist. The trick is to make a piece of media just intriguing enough to harness that craving for a good story, enough for fans to fill in the blanks if need be. The best TV shows and movies harness this need for likability, and encourage people to use their imaginations in showing devotion to or filling out the backstory for characters. This is how shows like Once Upon a Time and The Avengers amassed such a cult following. It’s not that they’re bad pieces of media. They know how to tease people’s imaginations just enough. People will latch onto any likeable aspect of a piece of media, and expand it. A show can be flawed. But enough fans inventing headcanon and creating fan art can keep it alive. It’s devious. This 100% explains why Babes in Toyland is only watchable if you start seeing Mary Quite Contrary as a closeted lesbian. Oh goodness, does it help. Avoid this movie if: You want a musical of substance. This isn’t one. This is the kind of musical that a brand-new theater fan sees and makes them quite Acting 101. This will make a long-distance runner out of any middle school theater geek that sees.